Boil your noodles as per the package's instructions, allowing about two servings for each person who's going to munch. When the noodles are finished cooking, strain them and then CHILL THEM. 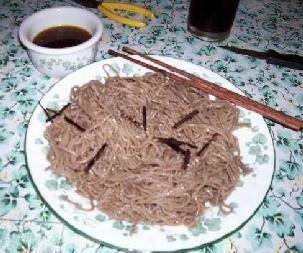 Zaru soba is served cold! To make the sauce, first make the 2 cups of vegetable broth with bouillon or however you're doing it. Bring it to a boil. Add in the Mirin, the soy sauce, and the seasoning. When heated, pour into little dipping dishes for each person. Eat the noodles by scooping up a chopstickful and dunking it in the dipping cup, then slurp it up. Note: This sauce is in no way a traditional zaru soba sauce. I've changed it extensively from some other recipes I've seen, because I'm vegetarian and limited in my abilities to find certain ingredients anyway (as I don't live in Japan). This sauce is untraditional but tastes great with the cold noodles! Yield: About 2 cups of sauce; chances are you won't need to double this unless you're feeding more than four people. Source: Original, after browsing many non-vegetarian versions of this recipe and coming up with vegetarian alternatives that don't taste horrible. 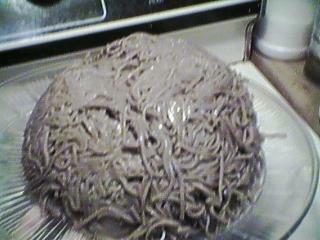 Note: After you chill the noodles in a bowl, if you dump them upside-down on a plate they look like A BRAIN!! !